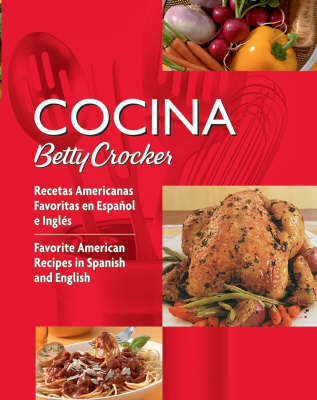 Cocina BC offers all-American recipes (roast chicken with vegetables, lasagna, apple pie) that Hispanic parents and children have come to enjoy at school, at work, at friends' houses, and now want to make at home. Spanish/English format helps with learning English as second language and appeals to bilingual families that may want to read the book in both languages. The book features 30 full-color photos and 125 recipes from the Betty Crocker Cookbook, 10th edition - The Big Red Cookbook. Every recipe appears in both English and Spanish. Each recipe will be featured in both English and Spanish (as a 2-page spread). Betty Crocker Easy Everyday Vegetarian, 2nd Edition: Easy Meatless Main Dishes You'll Love! Betty Crocker's Bisquick Cookbook: All Your Bisquick Favorites in One Great Cookbook! Betty Crocker's Cookie Book, Updated: The Most Delicious Collection of Cookies Ever! Betty Crocker's Vegetarian Cooking: Easy Meatless Main Dishes Your Family Will Love!